Until mid-September, Wyoming escaped the summer fire season relatively unscathed. On Saturday, September 15, the first day of rifle deer season, a “warming fire” was left abandoned in the Wyoming Range a few miles southwest of Bondurant. We spotted a huge column of smoke on Sunday as we drove home from fishing in Pinedale. The fire was roughly 15 to 20 miles west of our home in Hoback Ranches, but it looked like it could spread toward us. Dede and I decided that we should pack up our valuables – mostly fishing rods and equipment, and gather the stuff we usually move to our condo in Jackson in the winter. 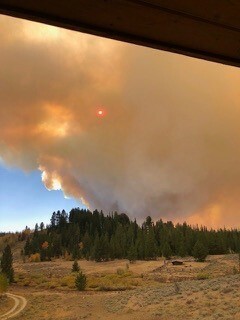 By the time we reached the condo on Monday afternoon, we heard word from emergency management that Hoback Ranches was placed on a “be ready to evacuate on a moment’s notice” alert. The fire was growing exponentially, and the winds were howling. When wind, temperature, and humidity factors present serious fire danger, a “red flag alert” is posted. The next two weeks were all red flag days (an unprecedented consecutive number of days). The next day, Tuesday, the order to EVACUATE was issued for Hoback Ranches, but we were already out, so no panic. As the week progressed the fire ran first one direction, then another, as the winds changed and gusted. By Saturday, it had spread to the southwest corner of the ranches and consumed three houses, but the firefighters were still confident that the fire line they were establishing would hold and it would not come further into the ranches. On Sunday everything changed. The fire made a huge run, jumping over the fire containment line and burned all the way through the ranches. It moved three miles in 15 minutes at one point and all the firefighters had to evacuate. The next two days were filled with anxiety for all the residents as we awaited word of the fate of our homes. We received word that our house and equipment garage were safe, but our historic little log cabin and our “bully barn” were destroyed. 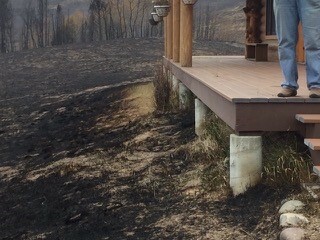 The fire came right up to our deck and stopped, and skirted around our driveway and garage. We were lucky. Many of our friends and neighbors were not. Most of the 6000 acres in Hoback Ranches were burned or charred and 55 of the 150 homes were destroyed. There are a few oases of green left, but for the most part the trees are gone. It is sad to see the blackened trees and grasses where beautiful green once prevailed. It is even more sad to see the burned wreckage of a building with just twisted metal roofing on the ground and a chimney left standing. The beautiful views we once had will be starker, but a new kind of beauty will emerge after the winter snows when re-growth begins. Teton Conservation District provides free wildfire risk reduction overviews and up to 50% of the cost of prescribed vegetation management surrounding structures and other wildfire risk reduction efforts. Learn more here.